Click a tab below to view related reviews. 01.2009: Review of Blow5 in Germany's Beat Magazine. Awarded 5 out of 6 stars. 10.30.2008: Key Magazine review of Blow4D, in German: "well-equipped, digital nearfield monitors in an affordable price range...."
June 2008: SoundMaker Magazine , from Greece, gives BLOW5D cover-treatment, as well as a 3-page review. According to the review (written in Greek), "Blow 5D is a very good speaker in its category. Suitable for home studios and DAW. Good value for money." The review went on to say that BLOW5D provides "good sound in general," is "fully equipped in digital field," comes at an "affordable price," and features "good design." 11.30.07: With their compact size, innovative features, and high quality sound, the BLOW5Ds are a perfect match for any studio environment. 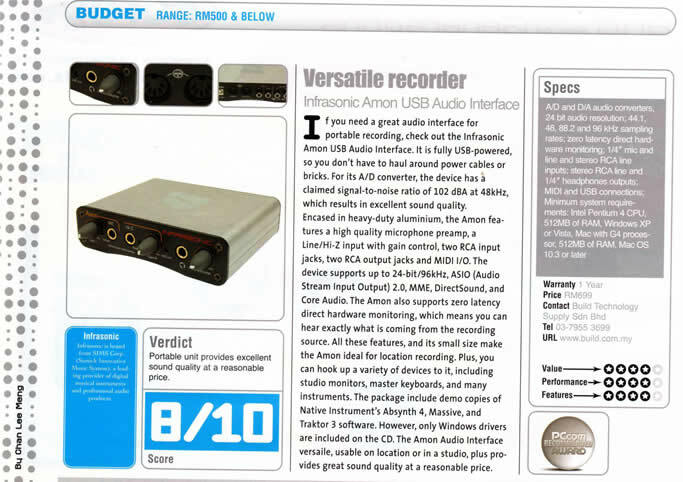 10.2008: Keys Magazine Review of Infrasonic Amon USB Audio Interface and DeuX Firewire Audio Interface, in German. 10.2008: Russia's leading review site, iXBT, puts the Infrasonic Deux through its paces, in Russian. 01.2009: "...a reliable interface for the road." 10.20.2008: If you ever tried to use a professional microphone on a computer you know how frustrating it is.... You need a preamp to make it work properly or a product like the Infrasonic Amon USB 2.0 Audio Interface. Keys Magazine Review of Infrasonic Amon USB Audio Interface and DeuX Firewire Audio Interface, in German. For translation in your language, use Google translator. April 2008: Portable unit provides excellent sound quality at a reasonable price. 12:2008: Beat Magazine review of Infrasonic Quartet PCI Audio Interface, in German. 11:2008: Beat Magazine review of Infrasonic Quartet PCI Audio Interface, in German. 11.30.2007: The INFRASONIC Quartet PCI recording interface is a 4X4 audio interface with a plethora of professional features. 11.27.07: INFRASONIC Quartet is a very interesting card with a good market potential. It's inexpensive and functional and will be an optimal solution for many users, who want a device for (less than) $200. 03.2009: Russia's leading review site, iXBT, puts the Primus a25 through its paces, in Russian. Sept.2008: SoundMaker Magazine , from Greece, calls the Primus a25 Keyboard / Controller a good choice for anyone whose priority is portability and stable functionality. A good solution for music creation when performing live, while traveling or even when on vacation. 02.24.08: Just thought I'd drop you a line to let you know that the Primus keyboard has turned out to be a great little piece of equipment. I haven��t really ventured into the midi controller stuff yet �� at this stage I��m just using the audio interface to record into a cool program I bought from the Rock Shop called "Steinberg SEQUEL." I can record guitars and vocals via the audio interface and also use it to play in midi instruments eg drums, keyboards. The USB power makes it very handy as I can use it with my laptop and not need any power. One hint you may want to pass on (certainly concerning Sequel anyway) is that you have to have the USB keyboard plugged in and turned on before you open the recording software. Anyway, I thoroughly recommend this product. I��m sure it would be great for use with Garageband and other programs like that. 11.30.07: The size is compact enough to allow complete portability so it is ideal for studio or location recording work. "We have all had musical or lyrical thoughts, but how do you record them without having some over-complicated recorder or hard to understand interface? Enter the UFO - USB microphone. This standalone mic is all you need to record those inspirational ideas to your Mac or PC with ease of use and very good quality." 01.2009: Russia's leading review site, iXBT, puts the UFO Microphone through its paces, in Russian. 12:2008: Review of the UFO USB Microphone in Beat Magazine. 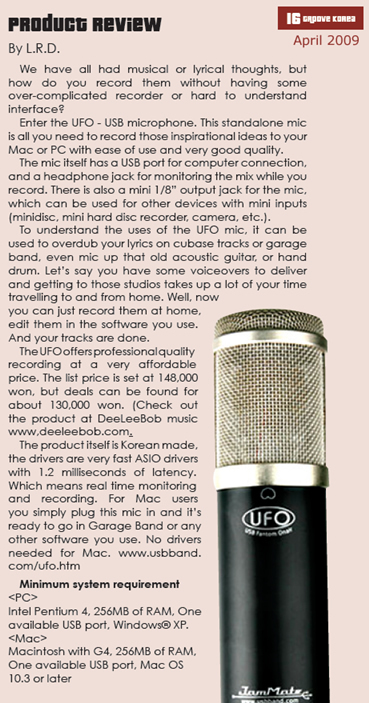 12:2008: Review of the UFO USB Microphone in Keys Magazine. The JamMate UFO USB Phantom Microphone is a unique product because the JamMate UFO is an "All-in-one" solution that includes both the "Audio Interface" and a "Phantom powered microphone." It essentially eliminates the need for a pro microphone and a preamp. Be sure to check out this video and hear the clarity of this microphone, it's amazing! 06.18.2009: The Windy 6 Firewire interface offers many tools for the home studio artist or mixer. Considering the card has 6 output and 6 inputs with Pre-amps and gain controls on two, phantom power Neutrik connectors, balanced output, Coax digital and dual channel inserts the Windy 6 is very versatile and inexpensive audio interface..... Infrasonic packed a great deal of features and audio muscle into this compact interface and all for a great price. We had a great time recording tracks and working with the interface, all features were simple to find and easy to use. 05.2009: Infrasonic Windy6 Rated 5 our of 6 by Germany's Beat Magazine. Praised for "flawless sound." 03.2009: Russia's leading review site, iXBT, puts the Infrasonic Windy6 through its paces, in Russian.